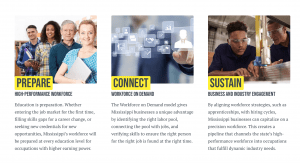 When it comes to workforce development, the state of Mississippi is utilizing multiple resources in order to create a more transparent and coordinated program for individuals who want to enter the workforce. Just this year, two workforce development summits have been hosted by top Mississippi officials. In January, Governor Phil Bryant hosted over 600 businesses in Jackson, as well as Speaker of the House Philip Gunn’s second summit held on Tuesday, April 16. The topic of increased workforce development seems to be dominating many conversations as a way to continue to move the state forward. In a Georgetown Study, the state was named as number two in the country for the number of jobs defined as “good jobs” as recorded by the Economy Scorecard in February of 2019. Part of that movement forward was initiated by the State Workforce Investment Board or SWIB. The board is headed by Executive Director Laurie Smith and chaired by Andrea Mayfield, Executive Director for the Mississippi Community College Board. It includes a board with members ranging from business persons to state department heads. Their mission is to bring that transparency and coordination to public and private workforce programs that are happening all across the state. 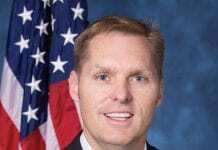 “The point is to organize and coordinate to help prepare, connect and sustain the workforce,” said Smith. SWIB has adopted three broad goals to help achieve the mission: Install an accountability system to track system-wide results and funding, consolidate workforce training efforts and reduce redundancy and administration, and involve businesses in defining training needs. SWIB uses things like Sector Strategy to identify the highest sector jobs in the four district areas of the state, in accordance with the federal workforce development plan. 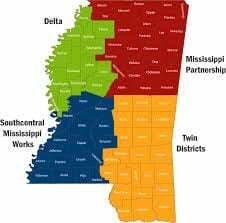 Those areas are the Delta, Southcentral Mississippi, Mississippi Partnership, and Twin District. The highest sector jobs include things like manufacturing, healthcare, information technology and transportation. In 2016 SWIB, along with many state partners, developed a planning document called the Workforce Innovation and Opportunity Act (WIOA). The goal of the WIOA is to strengthen the national workforce to become more competitive in the global economy. While also complying with federal guidelines, the WIOA intends to achieve this goal by placing the responsibility of creation and implementation of workforce plans soley on states. The plan focuses on the Sector Strategy information to reach the right individuals with the right access to the most prevalent and well paid jobs in their area. The WIOA is required to be submitted every two years, and the last one was submitted again in 2018. Before the last submission, a Boyette study was commissioned by the Mississippi Development Authority. The study held an online survey of all the people that use Mississippi Works, an initiative by Governor Phil Bryant. 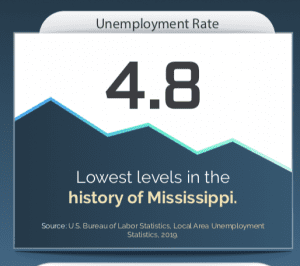 Governor Bryant’s goal was to build a stronger, more competitive Mississippi that can compete in the 21stcentury marketplace. The Boyette study made recommendations to the state on how to improve the workforce, of which Smith says were heard loud and clear. “I’d say we’ve done 90 percent of what’s in the report,” said Smith. Some suggestions made by the study include increasing clarity, an issue Smith said they were already working to rectify. A workforce inventory has since been started, containing 105 privately funded programs in the state. All of these programs either focus on helping people prepare, connect or sustain work. Another recommendation was to create a two year tuition free program for community colleges, coincidentally something the SWIB was already working to implement. Mississippi’s program will go into effect this summer and will offer two years of free tuition if you enter one of the sector strategies fields of work. The study also put an emphasis on the NSPARC, National Strategic Planing and Analysis Research Center. The report called it one of the most robust tools in the state. This program is a clearing house of data for the State Longitudinal Data System (SLDS). This is a program every state has. In Mississippi any agency, which Smith said was nearly all agencies, that contributes to the data serves on the SLDS Governing Board. This data helps lawmakers and those in positions of influence make good decisions about policy, versus using anecdotal legislation. From the data, the Vice President of Research at each public intuition, like Mississippi State or Ole Miss, work together to validate the data and the report. “The WIOA State Plan is built around Governor Bryant’s Pledge that every Mississippian who wants a job should be able to find a job. Through my agency partnership with NSPARC to create a ‘hub’ system to ensure that all participants are connected to the opportunity to be work or career ready and to secure a job right here in Mississippi,” said Jackie Turner, Executive Director for the Mississippi Department of Employment Security. The reports are made public on the LifeTracks website, designed to meet data needs for reporting requirements as well as answer policy questions. The data is related to education, workforce, and economic development. 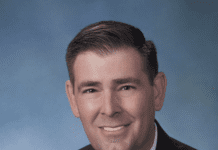 “Mississippi cannot view workforce development through a singular lens. Yes, we want to get people into jobs, but behind those employees are their family, or another generation. The Mississippi Department of Human Services has worked to develop and implement a “two generation” model that helps not only the adult, but also the children,” said John Davis, Executive Director of Department of Human Services. There would be no workforce without educated workers, so the study recommended working with middle school students in a new way. Smith says they’ve taken ideas from other states and are now planning to release publications of “jobs of the future’ to middle school children (8thgrade age) as well as 11thand 12thgraders. The magazines will include what sector jobs are available and where, what companies are hiring, where you can receive an education for that specific type of work, and what the pay scale looks like. They will also come with lesson plans for teachers. The first one is set to be released in August. There were numerous other recommendations Smith said the Boyette study made. 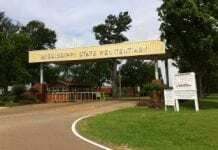 She said many were already being executed, and for those that weren’t SWIB officials were able to implement them in a way that worked best for the state. State unemployment numbers are low, with 80,000 more people working today than in 2012. The combination of the Mississippi WIOA Plan and the Boyette report have helped strengthen the Mississippi workforce. “Workforce development is a driving force behind economic development in Mississippi by leveraging our resources and engaging the talent within our state, we are looking toward the future for the citizens of our state,” said Smith.